Built in 1892, Harmony Hall long served the residents of this area. The Hall was, for years, the local meeting place. Harmony Community Center, formed in 1988 has continued to fulfill that function. The Center, a not-for-profit corporation, administers this historic building and opens the Hall to youth, seniors, families and organizations - to all residents of this community and surrounding area. During the years between the end of this History and sometime in the mid-sixties the Hall was used for all Community events by the Home Bureau, 4-H Clubs and the Harmony Fire Department. By this time the American rural life style had changed considerably. We became aware that the State did not look too kindly upon these old buildings. Sanitary codes were starting to be put into use and then too, people dressed differently and the old wood stove just didn't do the heating job any longer. The Harmony Fire Company had built an addition to their one truck building and it seemed to be easier to equip that, than to modernize the Hall. Thus the Fire Company took over the Community activities from the Farmers' Club. Not being used or needed, the Hall stood idle and the inevitable happened. The Hall was filled with unwanted junk that collected so fast no one wanted to even sort it out. They just pitched in more junk. When the Farmers' Club deeded the Hall to the Community, they stipulated that the Board of Fire Commissioners were to maintain the building. With the new addition to the fire house there really was no need for the Hall and this precious building just stood idle and neglected. In 1976 three ladies, all charter members of the Ladies Auxiliary of the Harmony Fire Department, were looking for a place to encourage the young people to use for local entertainment. They knew how much the doings at the Hall had meant to their families. However, they were getting nowhere, until they peeked in the back door of Harmony Hall. Now, these three ladies remember when Harmony Hall was THE PLACE to go in Harmony Corners. One look inside that building, and whether it was shock, indignation, or maybe just getting mad that the Hall should be so deserted, the old, spirit of get up and go surely did come out. We don't think they even stopped to ask permission. They just rolled up their sleeves and dug in. Even after four pickup loads to the dump, much sweeping, mopping and Lysol spraying, the building was still a sad looking specimen of the once lovely Harmony Hall. However, that touch of TLC (tender loving care) revived lots of happy memories for many Harmony and Charlton folks. Our three ladies got more and more help. 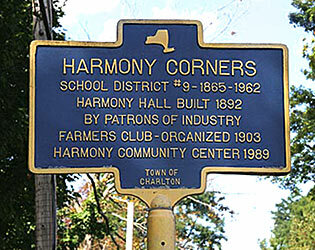 Then the Harmony Community Center was organized and had its first meeting August 30, 1976 and elected the following officers: President, Alice Pashley; Vice President, Walter Armer; Secretary, Alice Clements; Treasurer, Kenneth Clayton; lst Trustee, Frances Gannon; 2nd Trustee, Harry Wood; 3rd Trustee, Joanne Clayton. A discussion arose as to the purpose of the Center and all agreed that "the purpose is to provide a Community Center for the welfare of the surrounding area and to preserve, maintain and modernize so as to preserve the historical value of the building and property." To Mr. Kenneth Clayton and his two sons, David and Wayne, we owe a debt of gratitude for replacing the sill and strengthening the front wall. The leak by the front door disappeared when this work was done. Their voluntary efforts are certainly appreciated for without them we may have had to give up our cause. Thru the support of our good friends from all around us the Harmony Community Center was able to put heat, water and two modern rest rooms in the Hall. Curt Hackett earned his Eagle Scout Badge by leading the teenagers in painting the outside of the Hall. The Board of Fire Commissioners had the roof painted and the Firemen sanded and varnished the floor. Many people donated to, and bought from, our sales, etc. We would like to go on into more detail but--but—there always seems to be a "but". Legal entanglements with insurance etc. kept blocking our way so the Harmony Community Center gave the remaining work over to the Ladies' Auxiliary of the Harmony Fire Department. And that is how it stands today (1985). The Firemen and the Auxiliary working together to keep the Hall in use. The Harmony firemen are working to build a much needed new and larger firehouse. Until that is accomplished, the Hall will still be needed. Looking to the future we feel the Hall is so much a part of Harmony Corners it should not be allowed to go unused again. How many small crossroads of America have such a building left? Taylor Hall in the Village of Charlton and now the School House on Maple Avenue have been beautifully preserved. Why not add Harmony Hall to our Town's Credit? Between now and when the firehouse is built we do have time for the proper paperwork to insure the saving of this Historical Building. We hope everyone in the Town of Charlton, the Fire Departments, and all our good friends will agree with us, and we assure you it won't be long before we'll be announcing how you can once again support us and use Harmony Hall as before. The Harmony Community Center, a not-for-profit organization continues to maintain the building and encourage its use. The heating system was replaced. The Building has been recently painted, and the roof replaced (with a generous grant from the Galway Dockstader foundation) Though we have produced and hosted many events, these do not cover the operating expenses. Most of the funds for maintenance, insurance, heat and electricity come from publishing the Charlton Directory via paid advertising. This publication is a valuable element of the community, supplying frequent reference to residents and businesses. Check the Charlton NY Historical Society and the Galway NY Preservation Soc. for more history of the area. Also find Saratoga County history at Brookside Museum.